Be a Kingfield Get-Out-The-Vote Block or Building Captain! The Block Captain program is a new effort by KFNA to make sure everyone’s voice is heard in November. We’re looking for one Block Captain per block to make sure everyone on their block is registered, talk to them about early voting options, and encourage them to vote in the days leading up to Election Day. 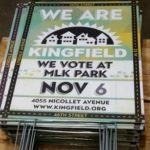 Twenty-five neighbors have already stepped up to this task, which is great, but with 100 blocks in Kingfield it is possible that they your block doesn’t have a contact yet and THAT means we may still need YOU to talk with your block neighbors and make sure they have a plan to get to the polls on November 6th.